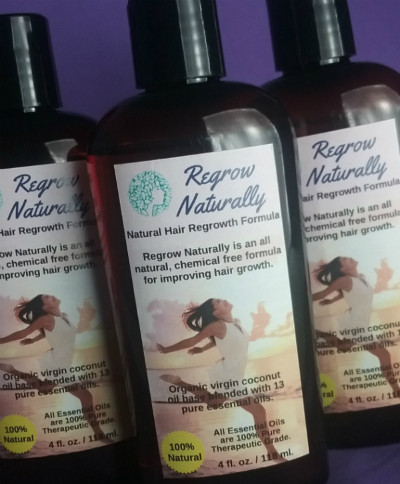 Regrow Naturally is a hair regrowth formula created from a coconut oil base married to 13 high frequency essential oils which, when massaged into the roots of your hair nightly, stimulate the sleeping roots to awaken and start producing new hair growth. The power of Essential Oils lays in their vibrational frequencies. High vibrational frequencies stimulate healing and with a nightly application you are slowly raising and stimulating the molecular structure of your hair and skin. By awakening the molecules, you are reawakening their original patterns back to a remembrance of their youthful performance. Put a generous teaspoon of the oil into the palm of your hand and with your finger tips, dip them into this little pool and begin massaging it into the roots of your hair ONLY, starting at your crown. Massage vigorously into the roots only all the way down to the base of the neck covering the sides and the front. Hair and Body Lotion too. 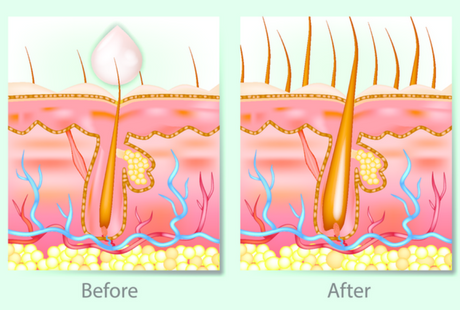 From a hair stylist who had breast cancer and lost her hair: I began rubbing it on my head and it brought so much relief. I am on my second bottle and my new hair regrowth enhancement is nice. It just feels good on my skin. That is all I use for a body lotion now. As I’ve gotten older my eyebrows thinned and began to look sparse. I decided to use Regrow Naturally to see what would happen. I liked the fact that it’s a natural product as I use it so close to my eyes. IT WORKED! My eyebrows are filling in and because I use a Q-tip to apply it where I want. I’m getting a brow line. HOORAY! I’m a believer! Thanks so much! How Do I Get a Bottle?